Many Apex Legends players are experiencing the game lagging or stuttering issue on computers. This is frustrating. But don’t worry. 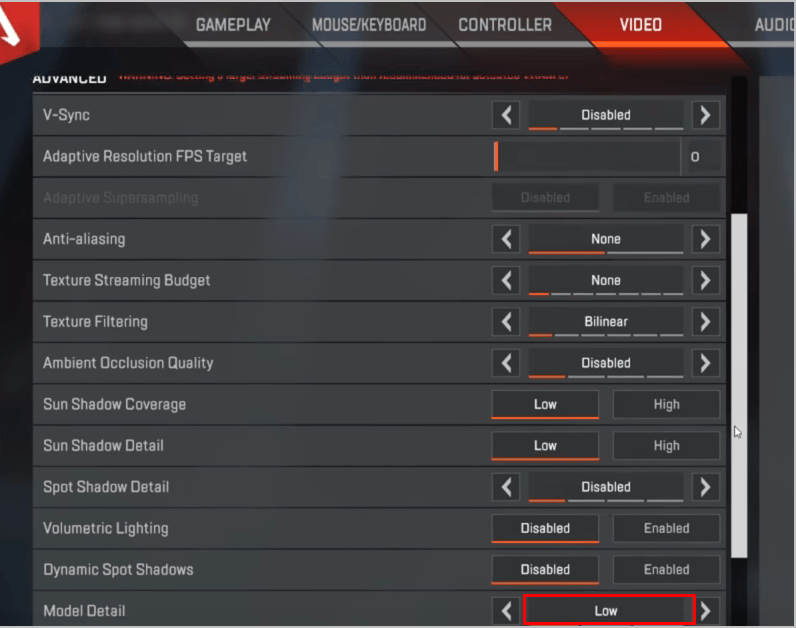 This post shows you how to fix Apex Legends lagging easily. Why is Apex Legends lagging? Your PC games usually lag when your PC hardware doesn’t meet or above the system requirements, especially your graphics card, RAM and CPU. Another reason for your Apex Legends laggy issue is that the settings in your game and your PC, for example, if in-game settings are too much for your computer, you’ll have the lagging issues. Here are solutions that have fixed Apex Legends lagging issue. 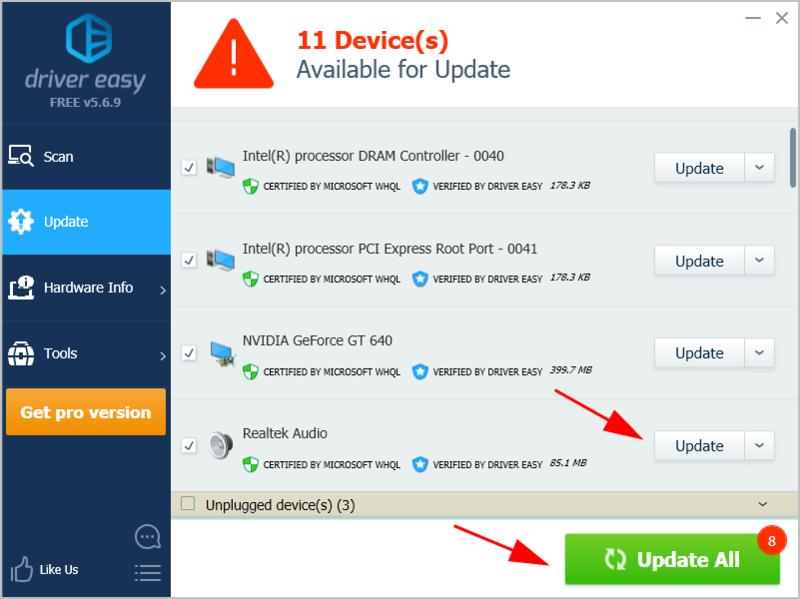 Note: the screenshots below come from Windows 10, and fixes apply to Windows 8.1 and Windows 7. If your computer doesn’t meet the minimum system requirements for Apex Legends, you’re no doubt having the lagging issues playing Apex Legends. So be sure to meet the minimum system requirements. You’ll be able to play Apex Legends just fine when meeting the minimum requirements, but it still will cause lags in your game. Having all the best specifications is recommended. Since many technical problems can be resolved by restarting, it never hurts to restart your computer and your game. Often this will be enough to fix your issue. 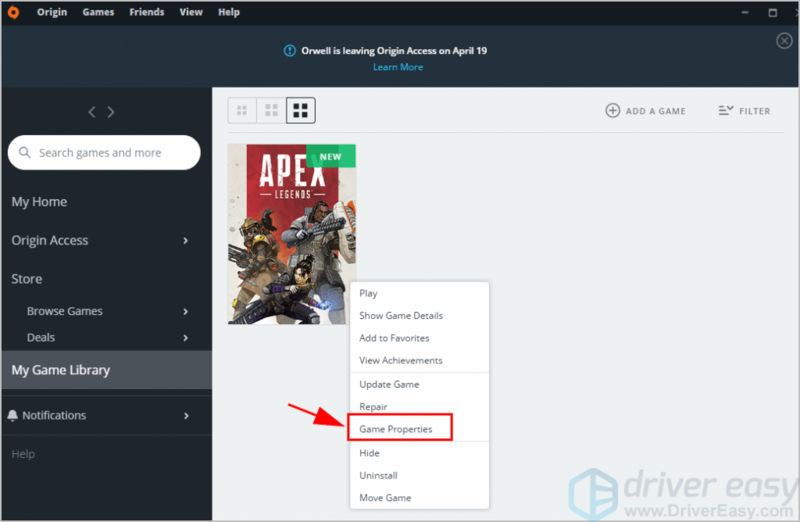 Game developers always keep releasing patches to improve their games and fix any issues, so you should check for updates of your game in Origin or from the official website. Then install the latest patch to keep it up to date. This can fix some issues like the Apex Legends lagging. 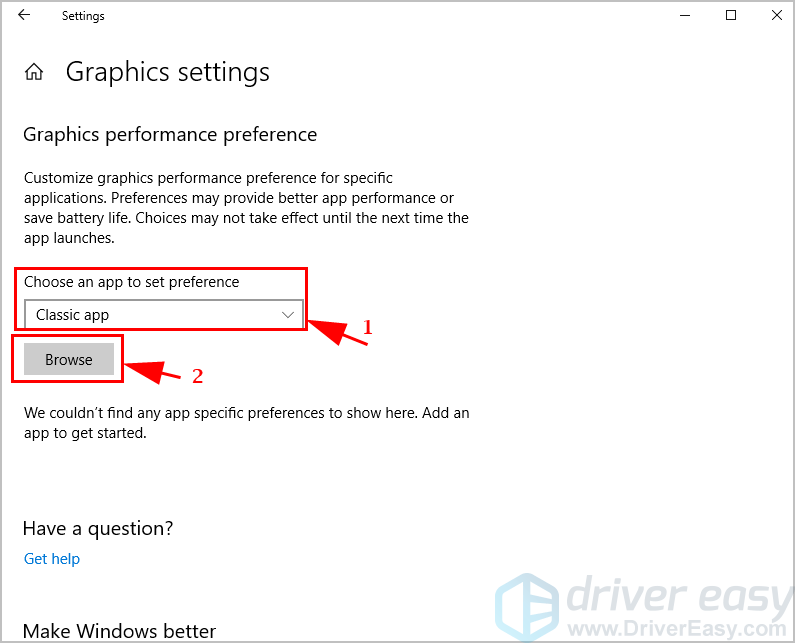 The missing or outdated device drivers in your computer can result in the game lag issues, especially your graphics card driver for FPS drops, or network card driver for the Internet lagging. 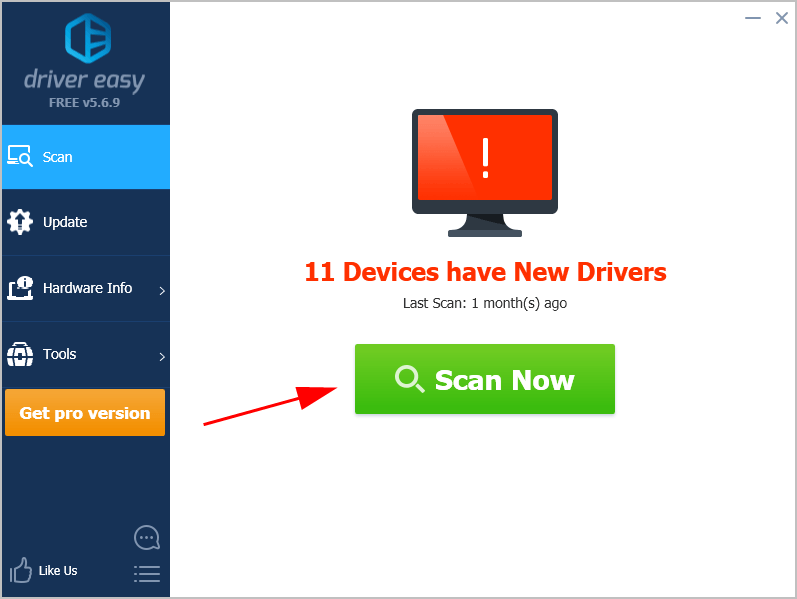 To rule it out as the cause for your problem, you should verify that your drivers are up to date, and update those that aren’t. Now launch Apex Legends and see if it reduces the lags. You should configure the settings in your computer, so Apex Legends has the best performances. 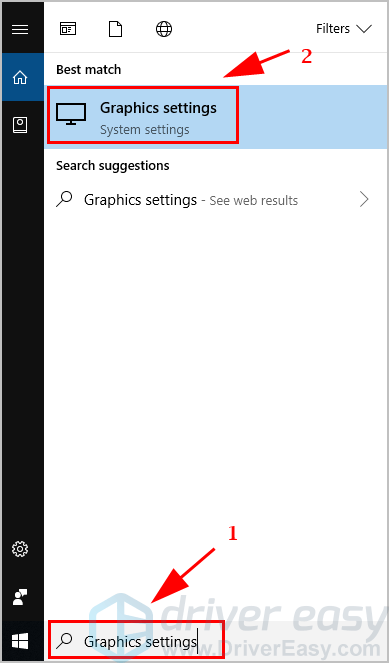 1) Type Graphics settings in the search box on your desktop, then click Graphics settings. 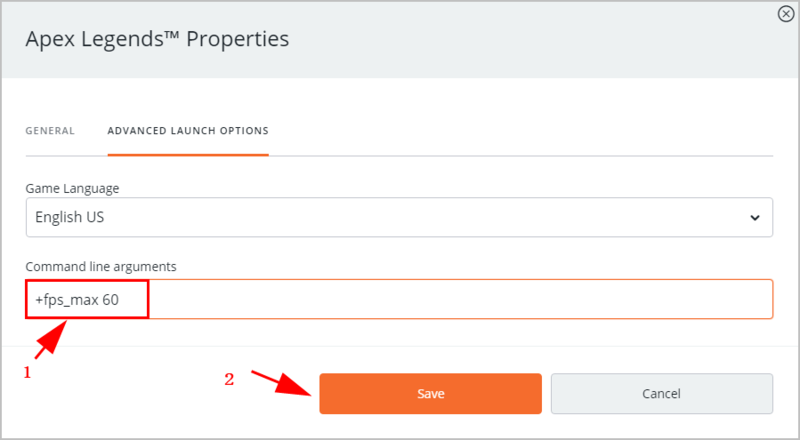 2) Ensure to set Classic app under Choose an app to set preference, then click Browse. 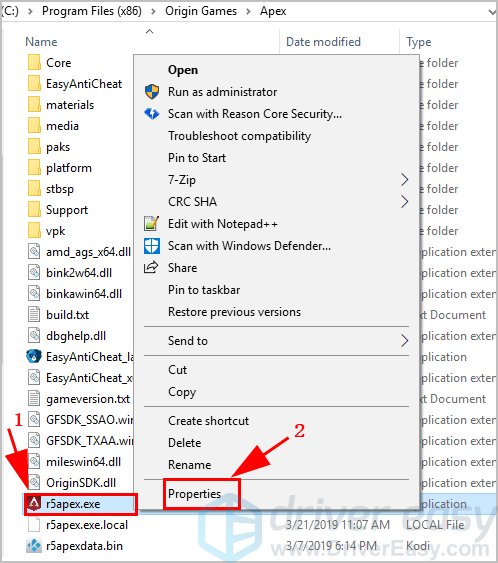 3) Navigate to the file location where Apex Legends application is saved. In my case I go to C:\Program Files (x86)\Origin Games. 4) Choose Apex Legends .exe. 5) Apex Legends app will be listed under the Graphics settings. Click it and click Options. 6) Choose High performance and click Save. 7) Restart your computer and open Apex Legends to see if it works better. The in-game settings in Apex Legends play a critical role if you can better play the game. So you should make sure to have the appropriate settings for Apex Legends. 1) Open Origin, and click My Game Library. 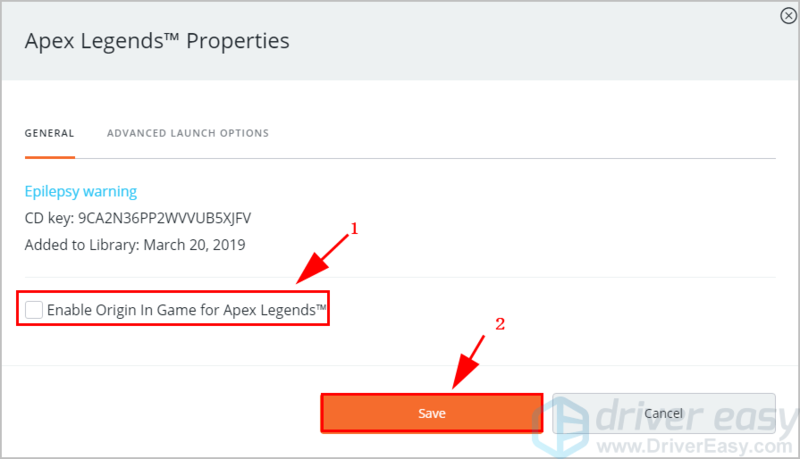 2) Right click on Apex Legends, and click Game Properties. 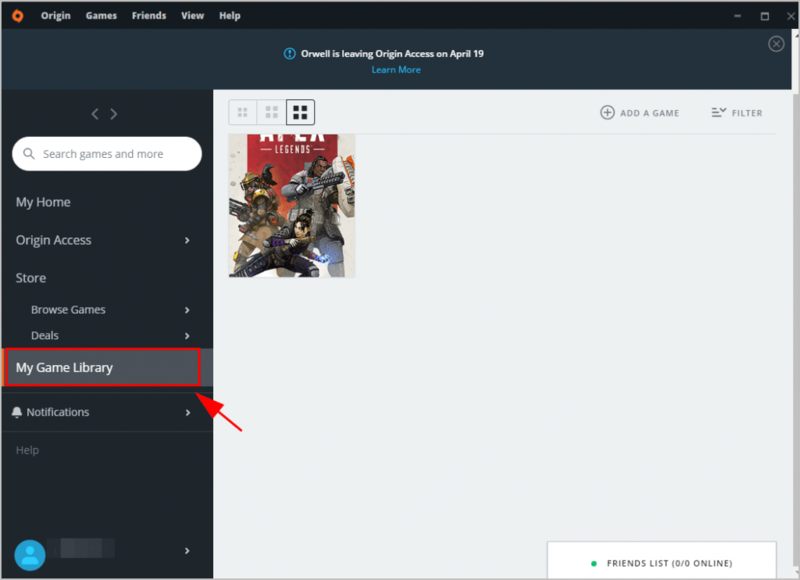 3) Uncheck the box next to Enable Origin In Game for Apex Legends. Then click Save. 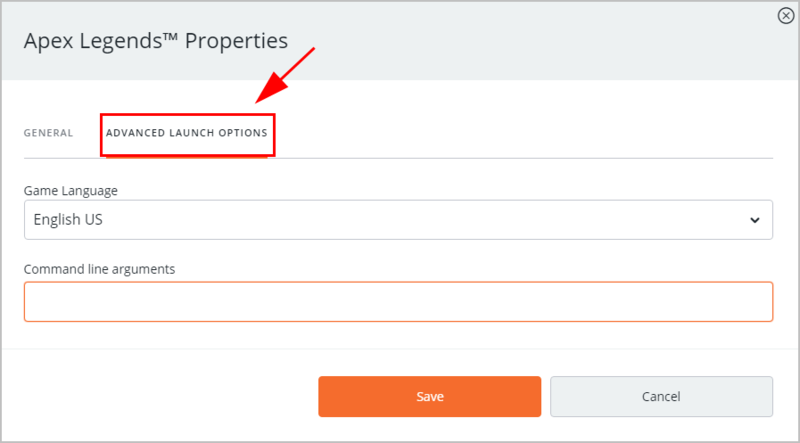 4) Click Advanced Launch Options. 5) Copy and paste the following command in Command line arguments and click Save. 6) Quit Origin and restart Origin. Open Apex Legends and check if it fixes the lagging issue. The Apex Legends lagging issues, including the FPS drops, can be caused by the improper game settings. 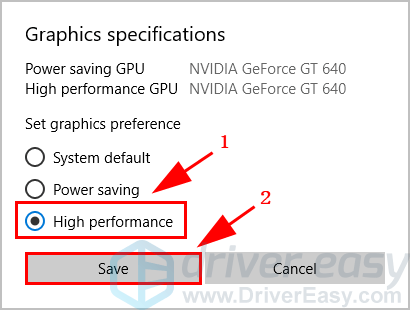 For example, if the graphics settings in the game is too much for your computer hardware, you should adjust your graphics settings to low. 1) Open Apex Legends Settings > Video. 2) Set V-Sync to Disabled. 3) Set Model Quality to Low. 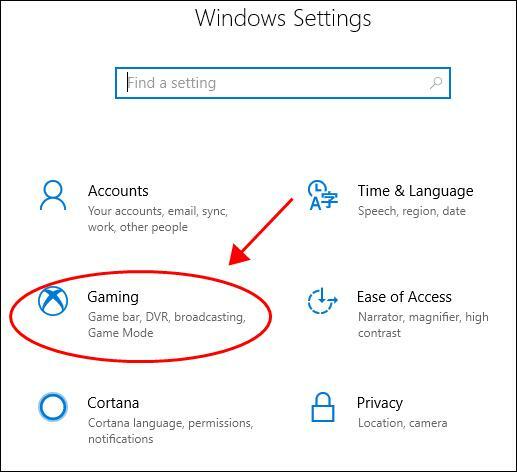 4) Set other advanced video settings to Low as possible. 5) Play Apex Legends again and see if it works better. The Fullscreen Optimizations feature enables the operating system in your computer to optimize performance of games when they’re running in full screen mode. You should try disabling it to fix the lags. 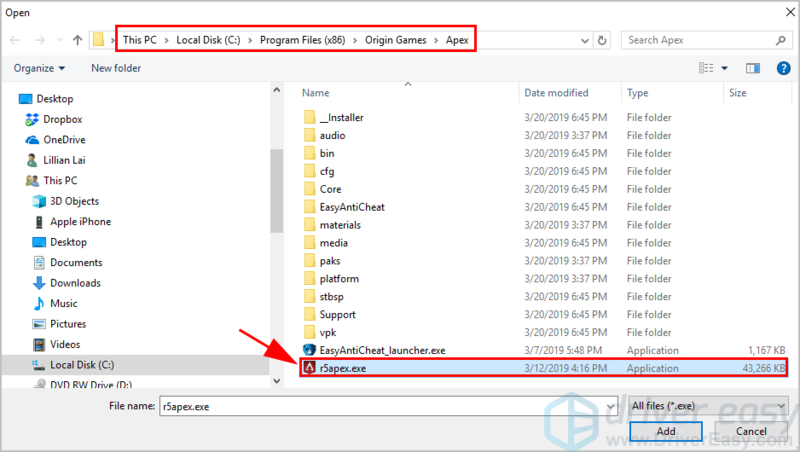 1) Open the file location where Apex Legends is saved in your computer. In my case it’s C:\Program Files (x86)\Origin Games\Apex. 2) Right click on Apex Legends.exe and select Properties. 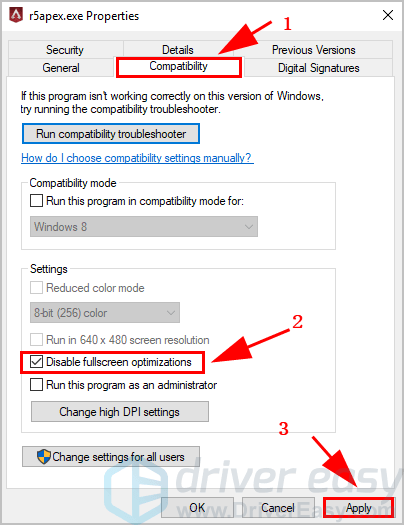 3) Click the Compatibility tab, then check the box next to Disable full-screen optimizations. Then click Apply. 4) Save your changes and restart your computer. 5) Launch Apex Legends and see if it stops lagging or stuttering. 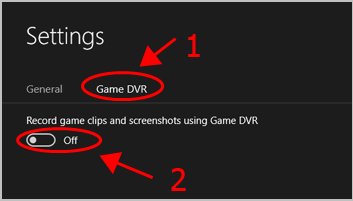 Windows automatically enables DVR in Xbox app, but sometimes this is incompatible with games running in your computer. 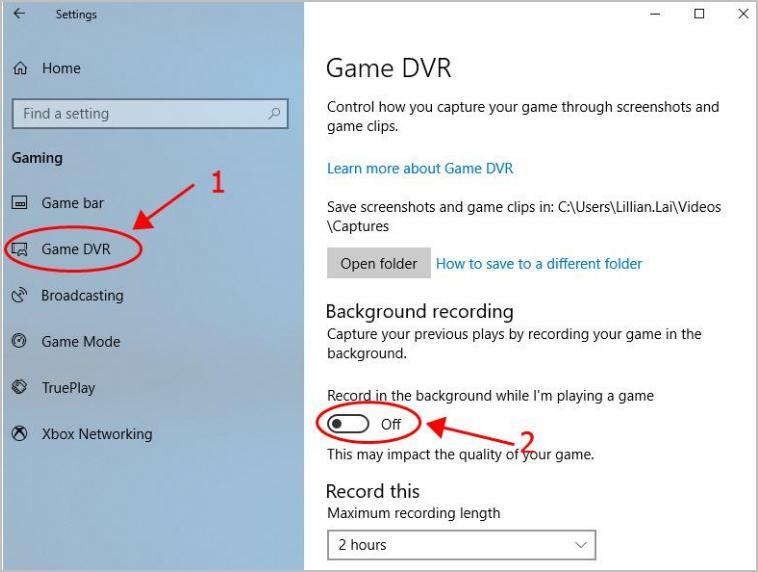 So you can disable DVR in Xbox to fix issues like FPS drops or game lags. 1) Search Xbox from the search box on your desktop, and open it. 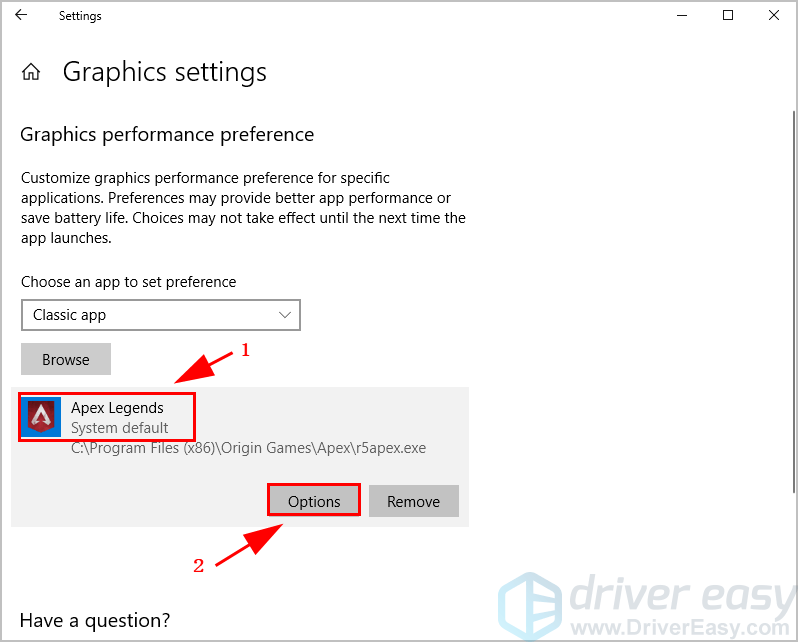 5) Restart your computer and open Apex Legends to see if it reduces lagging. 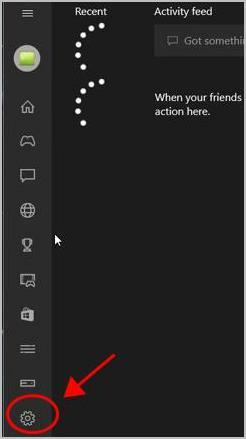 INFORMATION: If you don’t use Xbox in your computer, try uninstalling Xbox application to run your game properly. 1) On your keyboard, press the Windows logo key and I to open Settings. 4) Restart your computer and launch Apex Legends and see if it works. 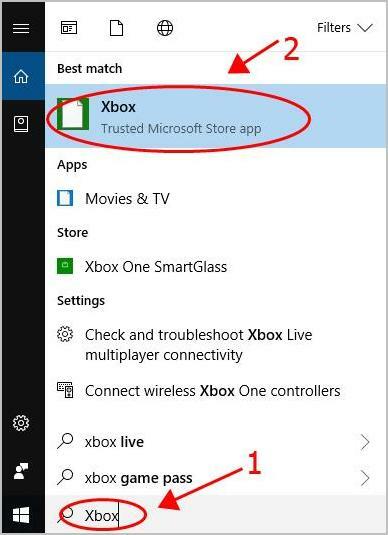 INFORMATION: If you don’t use Xbox in your computer, try uninstalling Xbox application to run your game properly. Then open Apex Legends and see if it works better. So there you have it – 7 easy fixes for Apex Legends lagging. If you have any questions or suggestions, feel free to leave us a comment below.